A new raptorial dinosaur fossil with exceptionally long feathers has provided exciting insights into dinosaur flight. 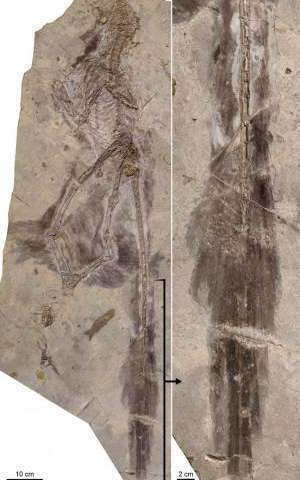 A paper published in Nature Communications on July 15, 2014 asserts that the fossil—discovered by an international team led by Natural History Museum of Los Angeles County (NHM) paleontologist Dr. Luis Chiappe—has a long feathered tail that Chiappe and co-authors believe was instrumental for decreasing descent speed and assuring safe landings. The 125-million-year-old dinosaur, named Changyuraptor yangi, was found in the Liaoning Province of northeastern China. The location has seen a surge of discoveries in feathered dinosaurs over the last decade. The newly discovered, remarkably preserved dinosaur sports a full set of feathers cloaking its entire body, including the extra-long tail feathers. "At a foot in length, the amazing tail feathers of Changyuraptor are by far the longest of any feathered dinosaur," said Chiappe. Analyses of the bone microstructure by University of Cape Town (South Africa) scientist, Dr. Anusuya Chinsamy, shows that the raptor was a fully grown adult, and tipping the scale at nine pounds, the four-foot-long Changyuraptor is the biggest of all four-winged dinosaurs. These microraptorine dinosaurs are dubbed "four-winged" because the long feathers attached to the legs have the appearance of a second set of wings. In fact, the long feathers attached to both legs and arms of these ancient predators have led researchers to conclude that the four-winged dinosaurs were capable of flying. "Numerous features that we have long associated with birds in fact evolved in dinosaurs long before the first birds arrived on the scene," said co-author Dr. Alan Turner of Stony Brook University (New York). "This includes things such as hollow bones, nesting behavior, feathers…and possibly flight." How well these creatures used the sky as a thoroughfare has remained controversial. The new discovery explains the role that the tail feathers played during flight control. For larger flyers, safe landings are of particular importance. "It makes sense that the largest microraptorines had especially large tail feathers—they would have needed the additional control," added Dr. Michael Habib, a researcher at the University of Southern California and a co-author of the paper. 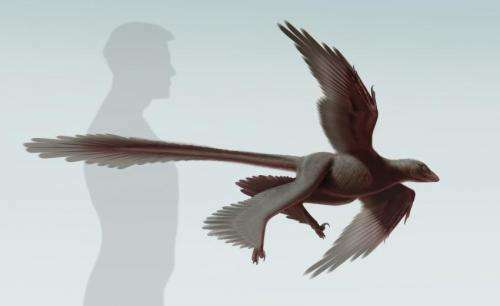 The discovery of Changyuraptor consolidates the notion that flight preceded the origin of birds, being inherited by the latter from their dinosaurian forerunners. "The new fossil documents that dinosaur flight was not limited to very small animals but to dinosaurs of more substantial size," said Chiappe. "Clearly far more evidence is needed to understand the nuances of dinosaur flight, but Changyuraptor is a major leap in the right direction." Is it a dinosaur or is it a bird? Or are they now considered by science to be one and the same? The article says no, it is a dinosaur. But it does not tell us what the line of demarcation is between dinosaur and bird. Dinosaurs have teeth, birds don't. There are other different characteristics too. If you are really interested document yourself, don't embarass yourself.